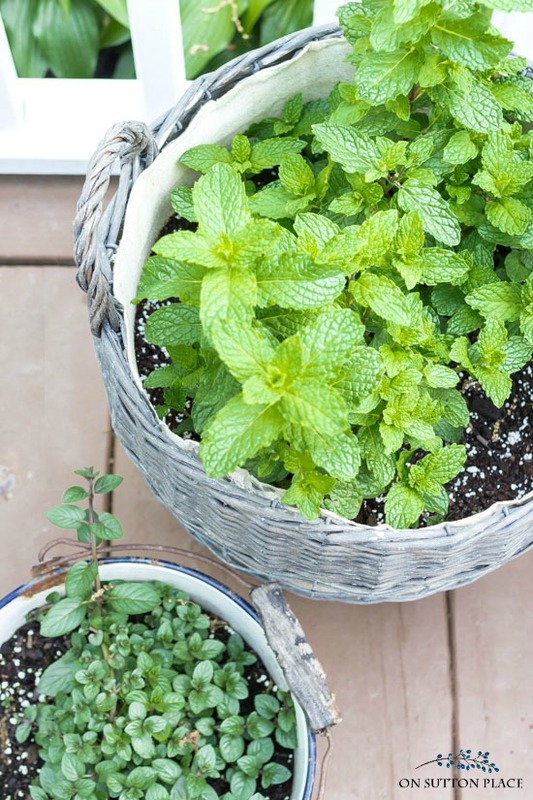 Grow your own herbs with these container herb garden ideas. Easy tips for getting a big harvest from a small amount of space. Growing herbs is one of the things I like best about summer. I’m to the point where taking care of our yard sometimes feels more like work than pleasure…but not when it comes to my herb garden. 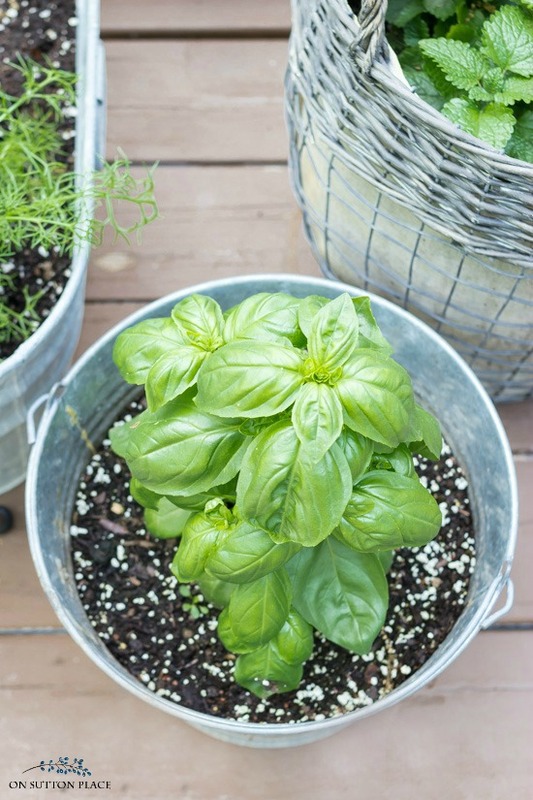 I love everything about it from choosing the containers, to planting the herbs, and watering. 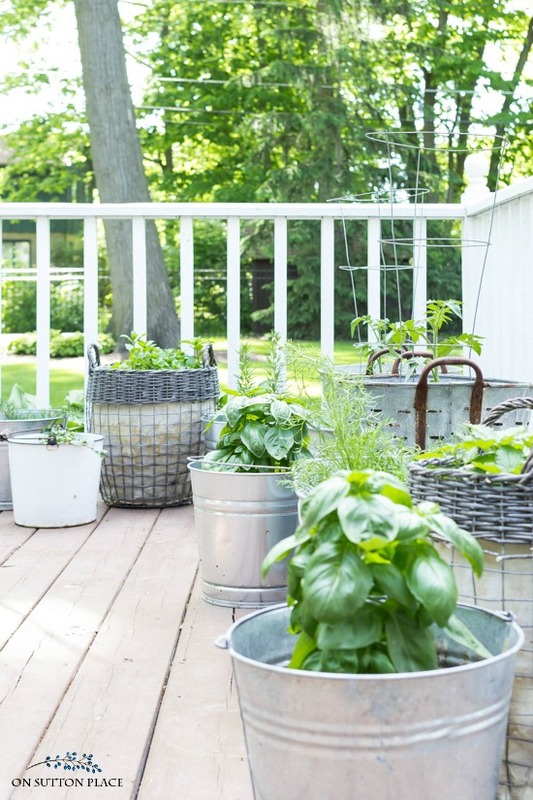 For a small amount of work, an herb garden offers a huge return. Every year I try to plant at least one herb that I’ve never grown before. This year I planted chamomile because I want to dry the blooms to make tea. More on that later in the post! Use whatever vessels you have on hand. 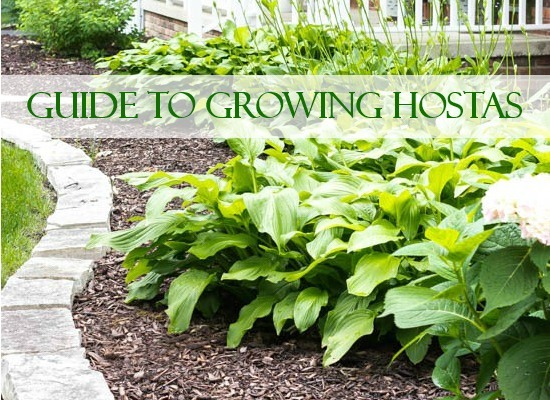 Planting an herb garden doesn’t need to be expensive or difficult. 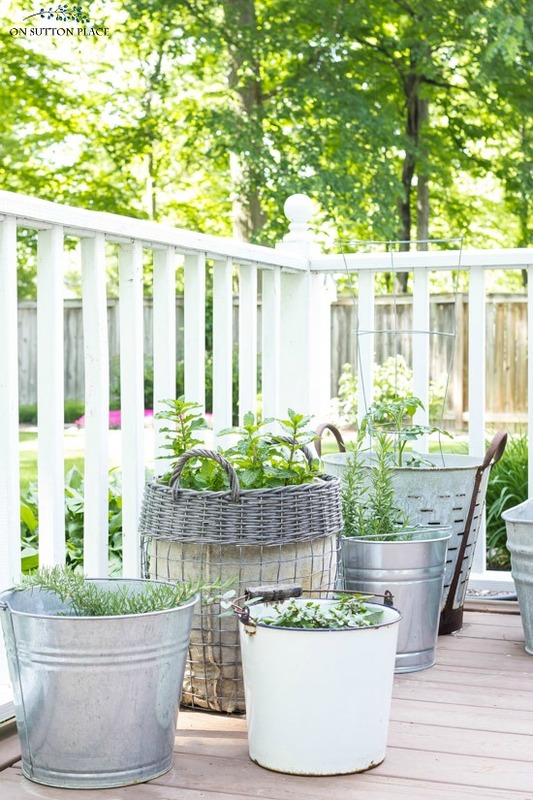 Simply gather some buckets or containers, fill them with potting soil, and plant whatever herbs you like the best. 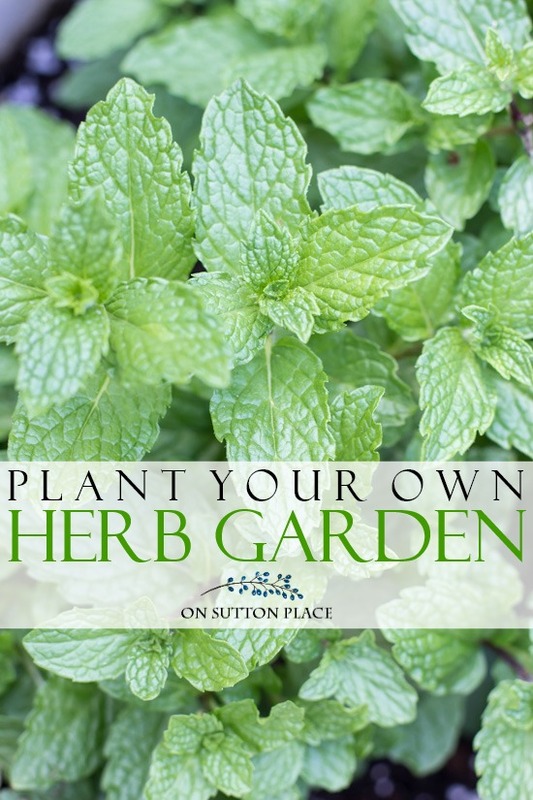 At this time of year, herbs are readily available at grocery stores, discount stores, home improvement stores, etc. Tip: Make sure to drill holes in your containers for drainage. 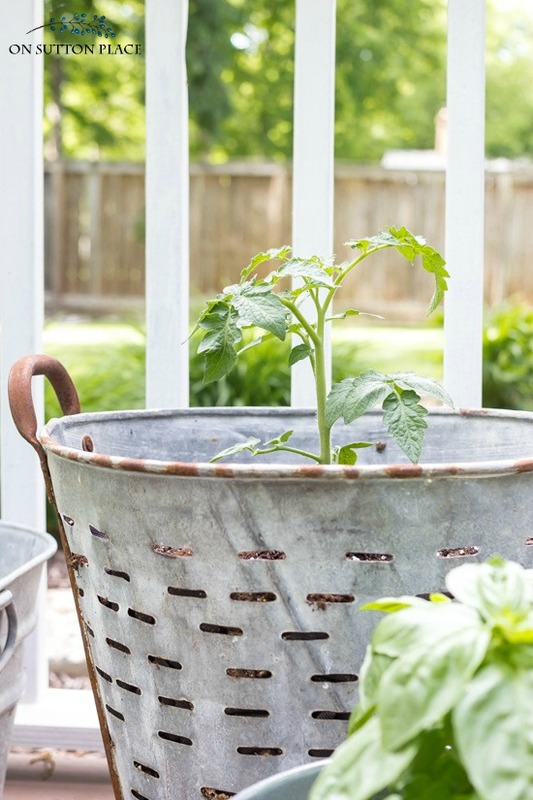 I use a mismatched collection of galvanized & enamelware buckets, olive buckets, galvanized wash tubs and baskets. I started out very small and each year I add a new container or two. This year I added the lined willow & wire baskets. I love the way they look with my other vintage containers and I’m hoping they weather well. I may have to replace the liner but that’s not a hard job. Tip: Place your container herb garden as close to a door as possible. Easy access is so convenient when you want fresh herbs while you are in the kitchen. Keep a hose stored nearby. Watering is perhaps the most labor-intensive part of maintaining an herb garden. Having a hose handy makes the job so much easier. I have a hose stand right on the other side of the deck railing and it makes watering a breeze. I don’t have the best luck when it comes to growing tomatoes, but I always plant a few each year and hope for the best. I never really know what type to plant, so I look for a variety that does well in containers. This year I chose Bonnie Organic Better Bush tomatoes. I’ll let you know how it goes! The rosemary and basil I use in cooking. The mint, chamomile, and lemon balm I’ll use for making tea…and I’ll use the mint all summer in drinks. I’ve been doing a little research and making your own tea doesn’t look too complicated. I’m going to try a couple of different methods for drying the herbs and as soon as I can figure it out, I’ll be back to share. 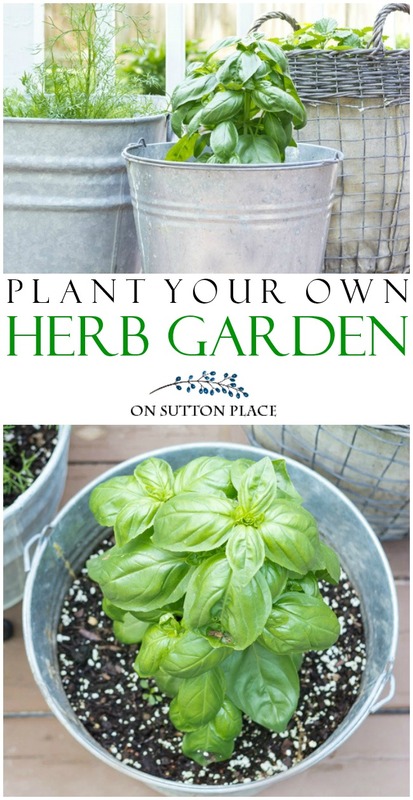 In the meantime, get busy and plant some herbs! 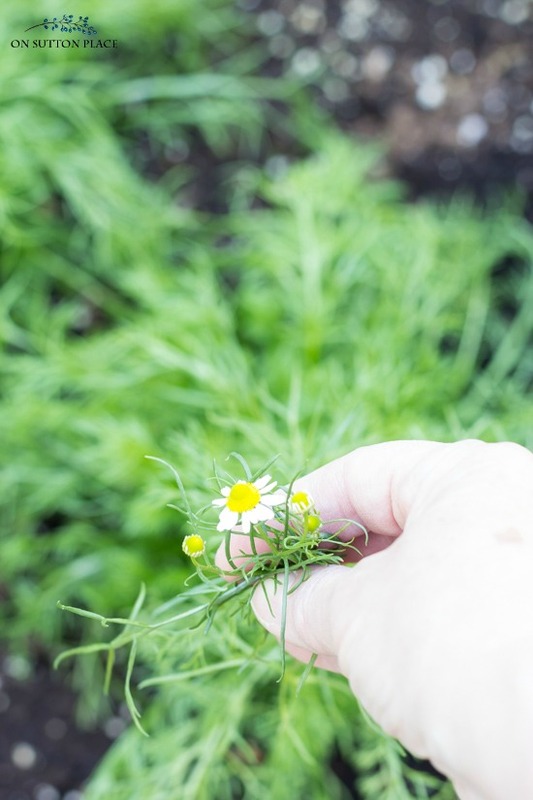 I already have a tiny bloom on one of the chamomile plants. I know it tends to go a little crazy so I put two plants in each of the galvanized wash tubs. With just four plants, I most likely won’t get enough blooms to make a huge amount of tea. I plan to mix the chamomile with mint or lemon balm to make it go a bit further. If I get a few jars of dried herbs I’ll be happy. 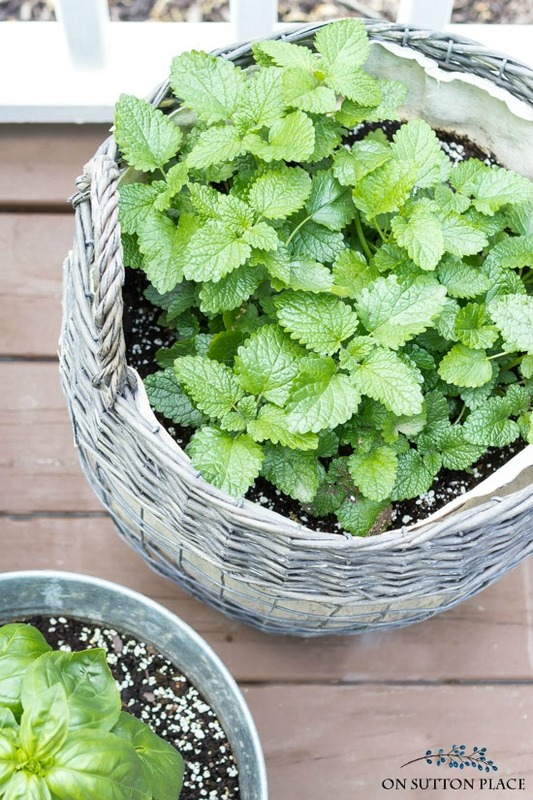 If you’ve never planted herbs, I hope you will take these container herb garden ideas and put your own stamp on them. If you are already an herb gardener, I hope you got a fresh idea or two. If you have made your own herbal tea, I hope you will leave your best tips in the comments! One of our favorite sandwiches is Bacon , Basil, and Tomato. My daughter and I were in New York on a Fashion Week buying trip for their shop. She suggested a small hole in the wall place to have lunch. We both ordered the BB and T sandwich. I swooned after my first bite! Basil instead of lettuce?? If you haven’t tried this toasted sandwich, give it a try. It is especially wonderful when you use your own home-grown basil and tomato. This sounds heavenly…I will definitely try it! Thank you for all the great advice on growing herbs. I’ve been growing herbs for almost 40 years. In pots on the deck I have rosemary, lemon balm, parsley, basil & thyme. I plant herbs in the flower & vegetable garden too, sage, oregano, lavender, chives, dill & have planted my mint on the edge of the woods so it can grow “wild.” Always great to use in cooking, to enhance flower arrangements & also fun to learn about their history & medicinal value. I enjoy your blog; keep up the good work! I also like growing herbs. I have sage, basil, oregano, lemon balm, thyme. Last year I had parsley, chives and rosemary which did not survive the winter. Rodale’s lllustrated Encyclopedia of Herbs has been very helpful to me and perhaps you would enjoy reading this book. Thank you for giving good practical information on your blog. Also, I could never make a bow until I used your instructions on the burlap bow. I have been growing herbs for many years. About 7 years ago I moved from containers to two raised beds 4 x 6 feet. They have served me well. I use herbs to cook and dry of course but I use them in flower arrangements, I gift them in bundles to friends who are thrilled. I make sachets, pressed into framed pieces, etc. etc. Such a huge return for so little effort! Lucky you that you can have your herbs so close to your kitchen. I have been growing herbs for many years but the spot they do best in is way on the far side of my house ,so what I do is cut a bouquet of parsley ,mint ,basil ,thyme etc and rinse them and put them in a vase on my kitchen counter . They are ready for me to use and they look very summery and smell wonderful . Glad to see you experimenting with herbs to use and dry. For nearly ten years my husband and I had a small acreage where we had the work and pleasure of a commercial herb farm. In the spring we sold herb plants from our solar green house and dried herbs and spices from our small gift shop year round. We had beautiful formal gardens where we gave tours and a large gazebo where I gave classes. We grew over 100 different herbs organically for culinary and medicinal use and I made our own teas, culinary mixes, and many herbal crafts including live wreathes and a dozen different varieties of bulk potpourri. As a former nurse I was eager to learn and teach others about healing with herbs. We lived and treated our family without prescription medicines for over twenty years. My husband has since passed and I live in town but still grow some herbs along with roses for potpourri and pleasure! Hi, I look forward to everything you have for us. You were talking about growing tomatoes, we have been growing JET STAR hybrid, oh I’d say at least 25 years. Jet star are low acid. I am a fellow Buckeye, in Akron. New to herbs, 1st yr.
Hi Ann, I chuckled when I saw your comment about the yard being more work than pleasure. I just came in from my second day of shrub trimming and I’m beat! But I do enjoy my little container herb garden. You’re the one who got me interested in growing herbs, and it makes me feel so “accomplished” when I use my own home grown herbs in my cooking, even though I’m far from being a gourmet cook. I especially found you’re All About Basil post extremely helpful. Thanks for all the inspiration and great ideas. Keep them coming! Ann…..grabbed 3 of your herb recipes. Thank you. I have 3 basil plants in the garden so far, chives, dill and Italian parsley. Haven’t tried container gardening yet. It was interesting to see your containers. I plan to get a Rosemary plant yet. I love rosemary bread and rosemary chicken. I checked out your bonnie plants and they have them 3 places or so near me. I now live in PA, so the growing season is shorter than Maryland, but not much. We’ve already been eating scallions from the garden. When mother nature cooperates, I can have a few ripe tomatoes by July 4th. Honestly, I think my problem is that there isn’t enough sun. I live in a wooded area and the most sun I get in the one section of our yard is about 6 hours. I still keep trying though! 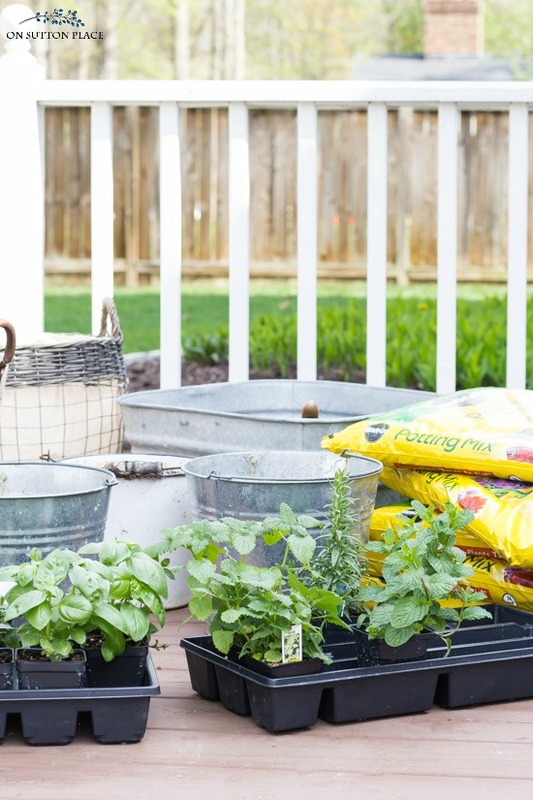 What do you put under the containers or in the containers to keep the soil from seeping out on the deck and causing a mess as well as a wet stain? Hi Christy! I don’t put anything under them. I have a wood deck that’s not in great condition…so I don’t worry about staining too much. I haven’t moved the wash tubs for a while so there is probably a mark under them. If I had a nice deck, I would try to raise them up on stools or benches. You could also set each container on small chips of wood to raise them up just enough to not stain. 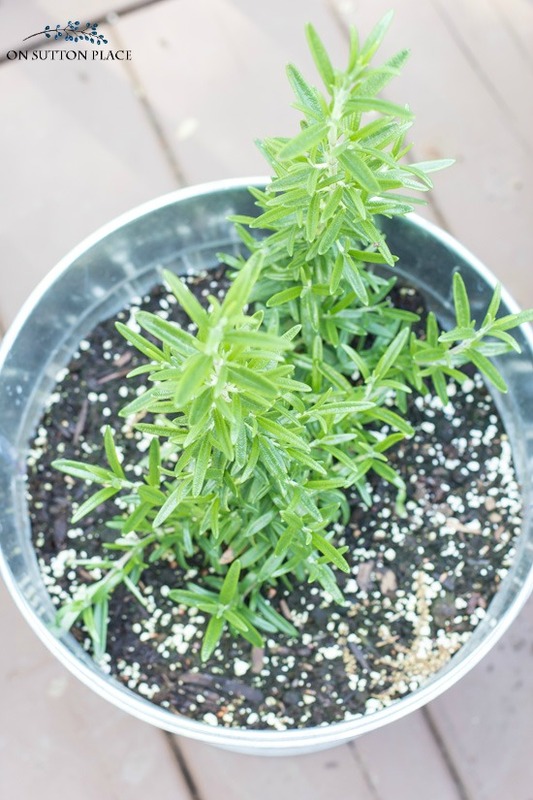 Thanks so much for sharing your ideas on growing your own herbs. I love using fresh herbs in my salads, baked goods, and cooked dishes. Like you, I grow rosemary, tarragon, basil, mint, chives, and oregano. I have several kinds of thyme which I thoroughly enjoy. 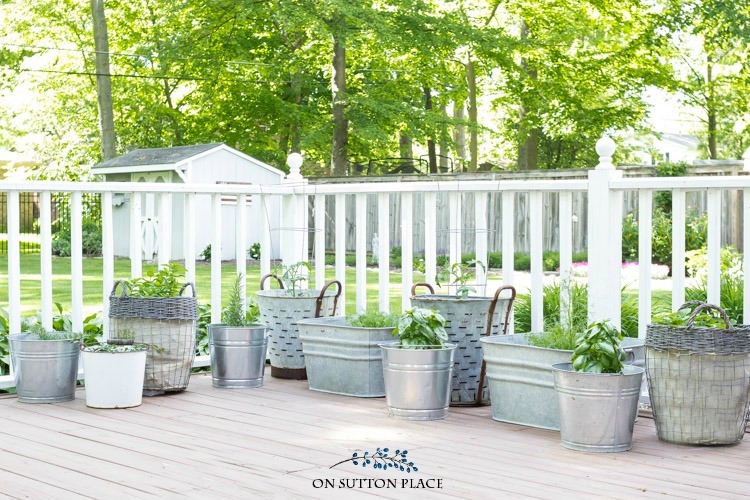 I’m thinking of making a planter as you’ve suggested – the galvanized containers – and giving one away at our family reunion. Thanks again! Love all the containers you chose, it will all look great when the plants start to fill in.Good luck with the tomatoes. I have lemon balm that has come back for the third year now and chives that have returned for seven or eight years. They are in raised beds, but I am going to transplant them into a collection of wine barrels that I have been saving just for herbs. I, too don’t have much luck with tomatoes. The birds love them too much! I have the best luck with cherry tomatoes, although this year the squirrels are eating them all! I haven’t picked ONE ripe tomato YET! My new thing is to add mint (and sometimes fruit) to water (I see you have a post on that!) Happy growing! Darn those tomatoes! I too plant at least 2 every year. I had high hopes for a great crop last year. I was watching my first beautiful Cherokee Purple ripen each day. On the morning of the day that I thought I was going to pick it, I discovered that a deer had enjoyed, not only my first tomato but my lovely teddy bear sunflowers that were about to bloom. Sigh. I love all the containers you’ve used for your herbs. I plant my favorite every year as well. As far as good results go, I’ve had good years and not so good. One type of tomato plant I’ve had great success is Tiny Tims. 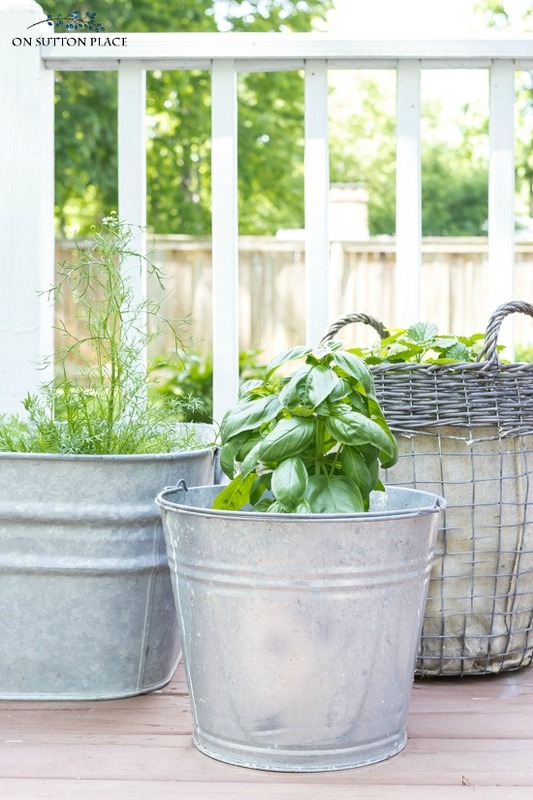 I love the idea of growing herbs near my door in containers. I am old and cannot walk/work in the yard anymore but love to see things growing! I shall try this this summer. I is time now to get some plants and do a small herb garden. Thank you for the sharing.